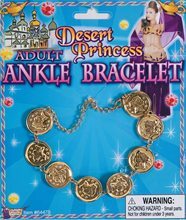 Desert Princess Ankle Bracelet.Includes: One Gold Ankle Bracelet.Available Size: One Size Fits Most Adults. 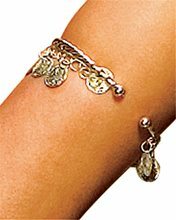 *Costume and Other Accessories Not Included.Arabian nights.Add a touch of gilded beauty to your look with this pretty anklet. 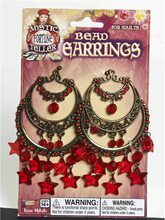 Perfect for genies, gypsies and desert princesses alike! Includes one anklet of linked golden coin. Bollywood Necklace.Includes: One Bollywood Necklace. Available Size: One Size Fits Most Adults and Teens. *Costume and Accessories Not Included. Sold Separately. Ready to bring out the Bollywood Bhangra in you this Halloween? In search of something to help you put together that awesome Indian dance number? Then this Bollywood Necklace is just what you're looking for! This fashionable accessory features an elaborate detail. Bollywood Hand and Finger Bracelet.Includes: One Bollywood Hand and Finger Bracelet Available Size: One Size Fits Most Adults and Teens. *Costume and Accessories Not Included. Sold Separately. Ready to bring out the Bollywood Bhangra in you this Halloween? In search of something to help you put together that awesome Indian dance number? Then these Hand & Finger Bollywood Bracelets are just what you? 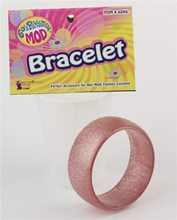 Mod Bangle Bracelet;Put the finishing touches on your 60's Go-Go costume with this shimmery Magenta Mod Bangle Bracelet. Available in three Color: 1. Magenta 2. Silver 3. Turquise.